After U.S. Open Cup action in midweek, we’re back to MLS on Friday night, when Real Salt Lake and San Jose Earthquakes lock horns. Jair Marrufo is the referee who will get Week 20 under way at Rio Tinto Stadium, before the Saturday action begins under the management of Irishman Alan Kelly. Kelly was the man in the middle for Philadelphia Union’s draw with New York Red Bulls last week, and his dialogue with AR Eric Weisbrod was the feature of PRO’s most recent Play of the Week, analyzed by Training & Development Manager Paul Rejer. 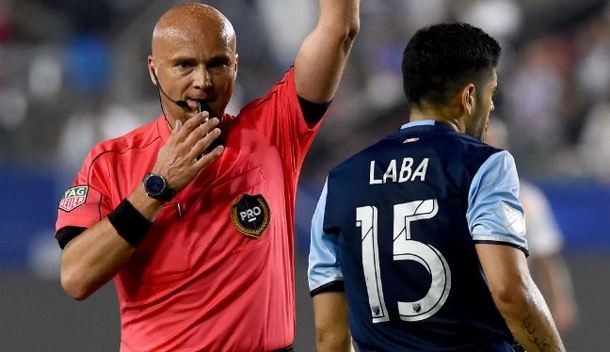 Matthew Nelson will be the AR for the MLS All-Star game against Arsenal next week, and he’s on duty in Canada this weekend when Toronto FC host D.C. United. Andrew Bigelow runs the other line, while Armando Villarreal takes the whistle for the seventh time this season. A further five matches take place on Saturday, including a fourth assignment of a rookie season for Jaime Herrera. The Mexican official made his debut in Week 11 when Houston visited the Quakes, and now it’s Texas for the 39-year-old, where the Dynamo take on Vancouver Whitecaps. There’s a big game at the top of the Eastern Conference, in Colorado, where the second-placed Rapids go head-to-head with FC Dallas, who sit three points clear at the summit. The experienced Kevin Stott, Referee of the Year in 2010, will oversee that match-up with FIFA AR Craig Lowry, fellow assistant Danny Thornberry and fourth official Sorin Stoica completing the crew. Juan Guzman and Ismail Elfath are the other two assigned center referees, and they will lead the teams out at New England Revolution and Montreal Impact respectively. On Sunday, it’s derby day in New York once again, with Western Conference leaders City heading to the Red Bull Arena – a venue which played host to a landmark workshop in midweek. A well-decorated crew take charge, with 2011 MLS Referee of the Year Mark Geiger supported by CJ Morgante – an AR in 2015’s CONCACAF Gold Cup Final and the recent Copa America – and Adam Wienckowski, who took the flag in the 2007 MLS Cup and the U.S. Open Cup final in 2009. Robert Sibiga is also in action and will bring Week 20 to a close. The Polish-born official is at Children’s Mercy Park for a meeting between the two most recent U.S. Open Cup winners – holders Sporting Kansas City against 2014 champions Seattle Sounders.